Veins of Color 26ct Natural Australian Solid Koroit Boulder Opal. 29.7mm x 20.2mm x 5.0mm thick. 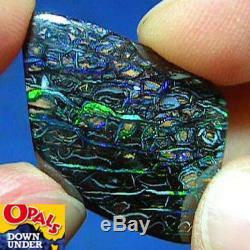 This natural australian solid koroit boulder opal has bright gem colors which fill the veins between the stone. The colors include green, violet and turquoise. The colors flash and streak superbly across the face with rotation of the opal and there is some play of color. There are touches of natural pitting on the surface of the opal. We pride ourselves in offering you boulder opal with bright gem colours. We go the extra mile to offer top quality opals in all price ranges. The item "Veins of Color 26ct Natural Australian Solid Koroit Boulder Opal See Video" is in sale since Wednesday, September 13, 2017. This item is in the category "Jewelry & Watches\Loose Diamonds & Gemstones\Loose Gemstones\Opal\Boulder Opals".